As the Ghouta campaign continues to unfold, we should expect that both politicians and mainstream media will give us - in the words of philosopher and theologian Reinhold Niebuhr - "necessary illusion and emotionally potent oversimplifications" intended to shape our perceptions of events. It goes without saying that such "emotionally potent oversimplifications" on Syria have formed the dominant paradigm through which the American public has received its information over the past seven years of war. From the State Department officials to think tank "experts" to the Graham/McCain axis to CNN panelists to the neocon twitterati and all the usual interventionistas who cast everything in terms of Manichean good vs. evil, darkness vs. light, bloodthirsty tyrants vs. noble populace - we've had to endure and fight seven years of a constant stream of propaganda on Syria. This worldview is what BBC filmmaker Adam Curtis accurately characterized as a 'goodies and baddies' dualistic vision of global events which keeps the Western public under the illusion that its own political leaders are perpetually driven by concern over human rights, defending the weak and oppressed, and spreading democracy over and against the unenlightened megalomaniac dictators of the world who are simply bent on brutalizing their own people. The question at the heart of this whole story is - Who was the ventriloquist? And who was the dummy? Maybe we were the dummy? By allowing perception management with its simplifications, falsehoods and exaggerations to create a simplified vision of the world - we fell into a fake universe of certainty when really we were just watching a pantomime. And now as the Arab Spring unfolds and reveals the true chaos and messiness of the real world - above all the horror of what is happening in Syria - we find ourselves completely unable to understand it or even know what to do. So those stories get ignored while we follow others with clearer and more simplified dramas which have what seem to be obvious goodies and baddies - thank god for Iran, North Korea and Jimmy Savile. Although the Syrian war is almost over, many Americans still don't understand what transpired over the last seven years, because the mainstream narrative has been an embarrassing mix of propaganda, half-truths and lies. 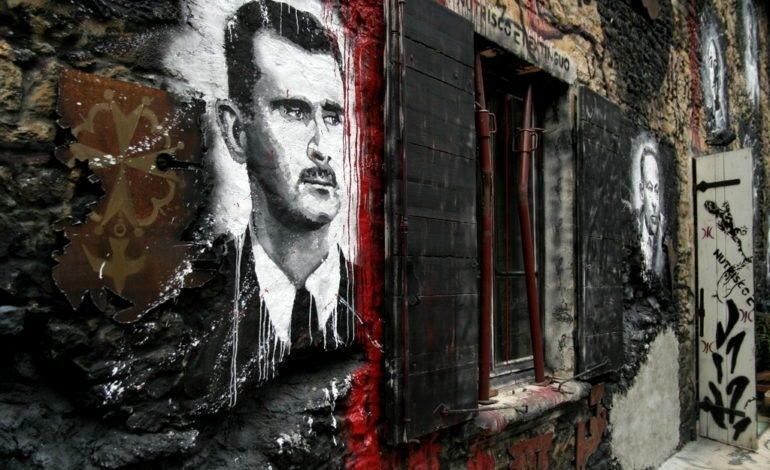 Oppressed by Assad's brutal regime, the Syrian people longed for freedom and democracy. One day, people started protesting in a small city. In response, Assad killed many peaceful protesters. However, this backfired and the entire country was engulfed in protests. Soon a civil war broke out, which led to millions of refugees fleeing Syria. Simply put, the Syrian "civil war" is an illegal, proxy war waged against Syria. In defiance of international laws, many countries have been sending weapons and terrorist mercenaries into Syria for the last seven years (to gain a deeper understanding of who wants to topple Assad and why, please read: Chaos in Syria: Part 1 - Three Motives and Seven Countries). In early 2011, US/UK special forces used Jordan's military base to assist protests against Assad in a border town called Daraa. With the Muslim Brotherhood's organizational skills and Saudi Arabia's deep pockets, violent protests spread thru Syria. Soon, an organized and armed militia known as Free Syrian Army (FSA) was created by the outsiders. After the fall of Gaddafi in late 2011, the US State Department and US intelligence agencies organized the shipment of tons of deadly weapons such as Stinger missiles and Sarin gas from destroyed Libya to Syria, via Turkey. Even with all this help, the American proxy force known as the FSA couldn't win the war. At this point, NATO and Neocons wanted to bomb Syria, but Russia and China vetoed the motion in the UN, so the imperial war by deception moved on to the next phase. In early 2012, someone dialed Al Qaeda (referred to as AQ or AQI in government documents). Zawahiri, AQ's top leader, called for help and experienced Islamic terrorists from all over the world rushed into Syria by way of Saudi Arabia's international jihadist recruitment agency. Secretary of State, Hillary Clinton, received an email from her chief adviser, saying that "Al Qaeda is on our side" . Watching the western media, the average person had no idea that we were supporting Al Qaeda or how heavily armed these "rebels" were. Western media and politicians also stuck to their talking points and referred to all these fighters as "moderate rebels." However, many of them are ruthless Islamists who use suicide bombers, behead even children, and commit unspeakable atrocities. They are also religious fanatics who seek out and kill Christians and Shiites. This is described in detail in the book, Deconstructing the Syrian War. When FSA and AQ failed to oust Assad, the "powers that be" started recruiting Sunni extremists in Iraq. In April 2013, ISIS was officially established out of the AQI insurgency. In the next year, these barbaric mercenaries would capture much of eastern Syria. This was also the year when Obama's red-line was crossed - the use of chemical weapons by Assad. UN experts who went to the site soon found that it was actually the rebels who had likely used the chemical weapons. The report was quickly drowned by the western propaganda machine. In late 2015, the Syrian government sought Russia's help. Within a month, the Russian air force weakened ISIS by destroying most of the oil tankers that ISIS was using to transport oil to Turkey. By the end of 2016, the Syrian government had the upper hand - Aleppo was liberated from Al Qaeda, and ISIS was running out of cash and morale. Furthermore, Trump had stopped arming the rebels in February. In late March, Trump and Tillerson dropped the slogan "Assad must go". After Russia had effectively defeated ISIS, the US didn't just leave Syria, since the real goal is to Balkanize Syria and prepare for a war against Iran. Thus the West is now trying to use Kurds as a proxy tool in this effort. It's likely that the US will have military bases in Syria for a long time. As long as the US government can keep borrowing money, such wild adventures will continue.